5 June 1921. Spain attends with some somnolence to the escalation of violence that will lead to the famous colonial disaster of Annual. As expected, this situation resonates like a more distant echo in rural Galicia, where the only revolution are the sporadic but typical downpours of the last days of spring. However, the peaceful place of “A Cibdade”, located on the north bank of the Limia River, receives a rare visit. This time, not only the inhabitants of the close villages of Portoquintela and Baños de Bande come to dig the land, but also four particularly well-dressed figures are approaching. They are Ramón Otero Pedrayo, Florentino López Cuevillas and Vicente Risco, prominent Galicianist intellectuals from the capital city of Ourese. The fouth well-known person is Farruco Pena, a local lawyer. 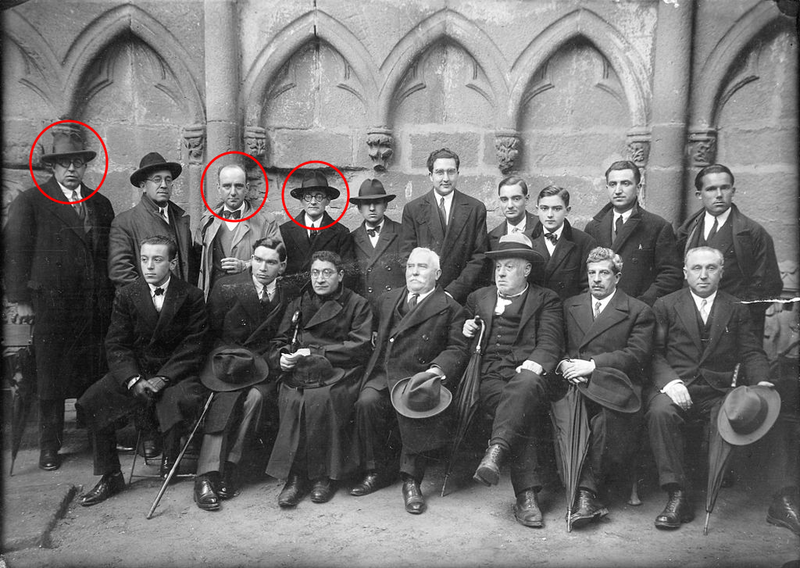 Members of the Seminario de Estudos Galegos in 1928, inside the Ruins of San Domingos de Pontevedra. From left to right: R. Otero Pedrayo, F. López Cuevillas and V. Risco. Source: Fundación Otero Pedrayo. Bad weather does not make them desist from their efforts and, at the end of the day, the trench opened by the locals has uncovered a well bonded wall and some pottery remains. Apparently, this is something usual in this place and just what the intellectuals were looking for. 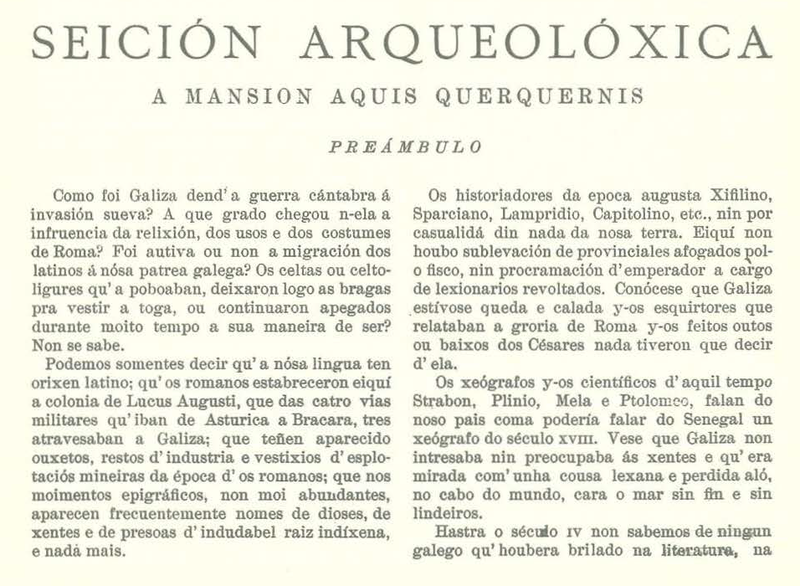 The volume 5 of the Galicianist journal Nós shows an accurate deduction: those were the remains of the mansio “Aquis Querquennis” referred by the Antonine Itinerary. Paper of López Cuevillas in the volume 9 of the journal Nós. A new visit just a few months later (10/09/1921) will even improve these optimistic expectations. The opening a larger trench will allow the discovery of an imposing wall. The great area in which archaeological features were documented makes Cuevillas state that they were facing the ruins of a “Roman or Celtic-Roman” city. Since then, the site became part of the usual scholarly catalogs of those time. Even the place was included on the “tour” the Provincial Commission of Historical and Artistic Monuments of Orense made to this area in 1935. Construction of the dam of As Conchas (1945). It is said that a worked was buried alive by concrete. Photographies taken from this website. However, new archaeological interventions will not take place here during the 1930s. The outbreak of the Spanish Civil War (1936-39) difficulted any action in this regard. Sin embargo, no se producirán nuevas intervenciones arqueológicas durante estos años. On one hand, after the war the Galician intellectual elites were dismantled; on the other, we assisted to a new scenario in which different policies and needs overcame the cultural, ecological or heritage interests. As it happened in many other locations in Spain, the Franco regime studied to build a dam in As Conchas. That implied the waterlogging of much of the Limia River valley . Inauguration of the dam by F. Franco en 1949 (left). The dam and the barracks of the Village of As Conchas in 1957 (right). By 1948 the village of Baños de Bande was already under water. Its inhabitants were relocated to temporary facilities and a stream of expropriations, land deals and parcellings was still shaking the region. The reviewing of the A (1945-1946) and B (1956-1957) Series of the “American Flight” allows us to check the physical magnitude of these changes. Nevertheless, only only the pysical space was altered: from dask to dawn the sociocultural dynamics of severalrural communities were dynamited. Archaeological sites in relation with the dam of As Conchas. Orthofotos from the USAF, 1946 and 1957. 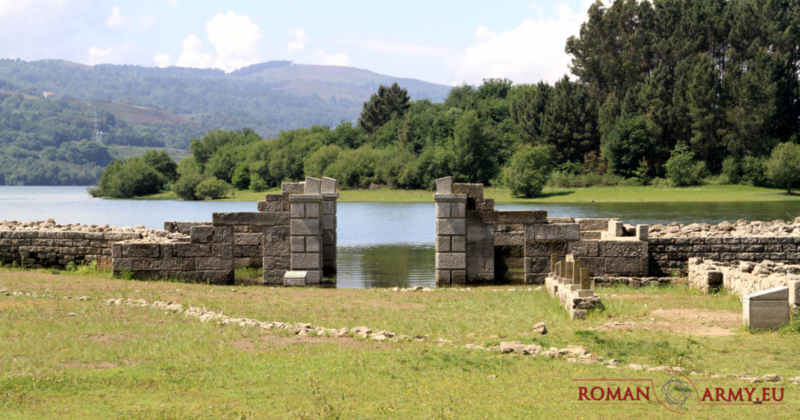 With regard to the archaeological heritage, the dam waters completely covered the site of “A Cibdade” as well as much of the ancient Via Nova, a Roman road that linked Braga and Astorga. Close to As Conchas, there also was an ancient Roman bridge source of a rich oral tradition: A Pontepedriña. The structure was declared Historical and Artistic Monument and restored in 1944, but this did not prevent their destruction. And after that, the silence. Time slowly blurred the physical scars of the flooding and the rich local archaeological heritage was practically forgotten. A Pontepedriña in 1900 (left), 1943 (centre) and the 2000’s (right). Photographies taken from this website. The archaeological excavations returned to “A Cibdade” in 1975. Under the direction of A. Rodríguez Colmenero, F. Herves Raigoso and S. Ferrer Sierra they have continued until today. We know now that in Bande existed a Roman fort founded in the last decades of the 1st c. AD and it is the most explored of the entire Iberian Peninsula. Around it it also grew an important civil nucleus which lasted long after the departure of the military contingent. But the archaeological works are not exempt of some risks ans discomfort, since they are largely dependent on the level of the dam waters. Recent aerial photographies clearly illistrate this fact. The Roman Fort of Bande in 2006 and 2014. Although the Fundación Aquae Querquennae-Via Nova has developed an important role in the conservation and enhancement of the archaeological remains of the area, the very existence of the dam hinders any attempt to develop an ambitious project for a better understanding of the evolution of the archaeological landscape as a whole. In addition, monuments like A Pontepedriña are practically razed and the initiatives for their recovery have resulted in failure. Fortunately, other interesting archaeological sites in the nearby, such as the hillforts of Rubiás or Lobosandaus, have not been affected by this process and they could help enormously to understand the transformations experienced by the region with the arrival of Roman troops. The dam of As Conchas the day of the inauguration (left) and nowadays (right). Y después de la conquista ¿qué?